With all this in mind, knowing I’m a devoted fan of both franchises, we need to talk about Star Wars. Specifically, the new show in Tomorrowland, “The Path of the Jedi”. My son, who has a developmental delay, was diagnosed with Autism this last summer. As a young toddler, he could not point, wave or say more than five words. Can you guess what three of those words he DID have before 27 months were? “Star”, “Wars” and “Jack” (Skellington, that is). Until he was nearly three years old, he could barely speak or communicate his needs, but he could sing both the Star Wars theme song and the Imperial March and he could ask for his “Jack Movie”. He recognized the music for Star Wars everywhere we went. In stores, stranger’s ringtones, commercials and to see his face light up like Christmas each time he heard that famous musical phrase, was something that brought us tremendous joy and pride. Star Wars was one of only two things in the world that he deeply connected with and for a child who didn’t seem to connect with much at all, this was HUGE. 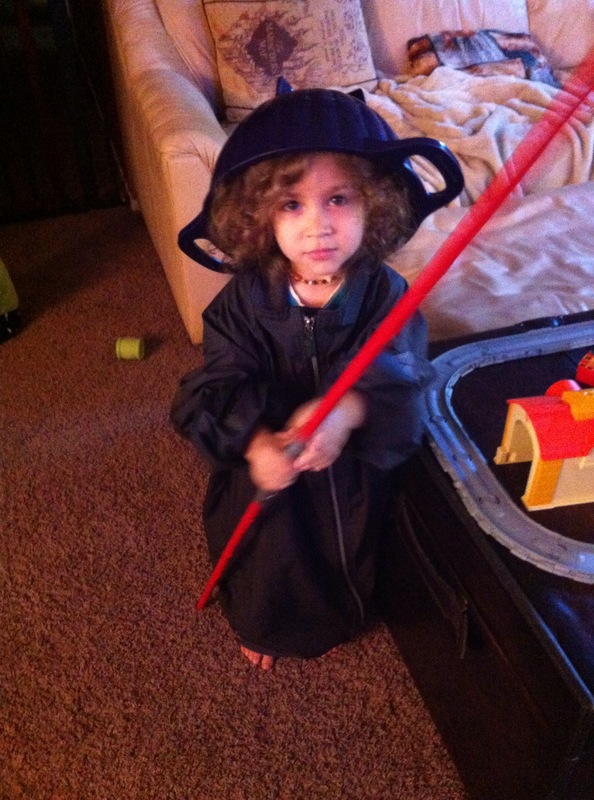 He played lightsaber games and invented his own costumes with random items around the house. Star Wars was one of only two things in the world that he deeply connected with and we did all we could to encourage it. Early on, my husband and I decided we would not allow our children to know the whole story until they were old enough to understand it. Here is the entry where I discussed this decision at length. We made the choice to keep the Anakin/Vader, Vader/Luke and the Luke/Leah situation under wraps for several reasons, but one major one, was because we wanted them to understand the transition of Anakin into his role as Vader and not get confused about good vs. evil, since Anakin is a “good guy” in everything that is age-appropriate at this point. We also felt trying to explain it all would be too complicated and the special-ness of it would be lost entirely. Most of all and most important to my point today; sharing the many spoilers of the series too early in their lives would deny them the ability to have that “ah ha!” moment that so many of us were lucky enough to have. When we were kids, we got to learn about that as it happened. Do you remember the first time you watched the horrifying scene? “No, I am your father!” … it gives me chills just thinking about it and I know that is because my first encounter with this reality was a complete shock. I wanted my children to have that experience and to feel all the feels they could feel for the Skywalker family, as well as later, when they see how their Anakin from Clone Wars is THEE Anakin who grows to become Vader, Luke and Leah’s father, betrayer of the Jedi Order and dies at Luke’s hand after having his mask removed in a touching, powerful moment of redemption. I want my children to experience all of this at a time in their lives that I decided, when I chose… when they could understand it, take it all in and feel for these characters as the story unfolded in a carefully monitored order on MY timeline. Now I know this sounds like helicopter parenting to the max, but it’s really not. It’s denying them access to 4 movies that are not age appropriate for kids their age anyway, and not spilling the secret in conversation. They can pretty much watch anything else. We’ve let them watch Episode 4, Episode 1, the first 2 seasons of Clone Wars and the Lego Star Wars movies because none of these have specific, direct spoilers to give it all away. There are a few “almost” spoilers in the Lego movies, but nothing they’ve caught on to yet. I’ve spent five years keeping this secret and asking friends and family to keep it with me. 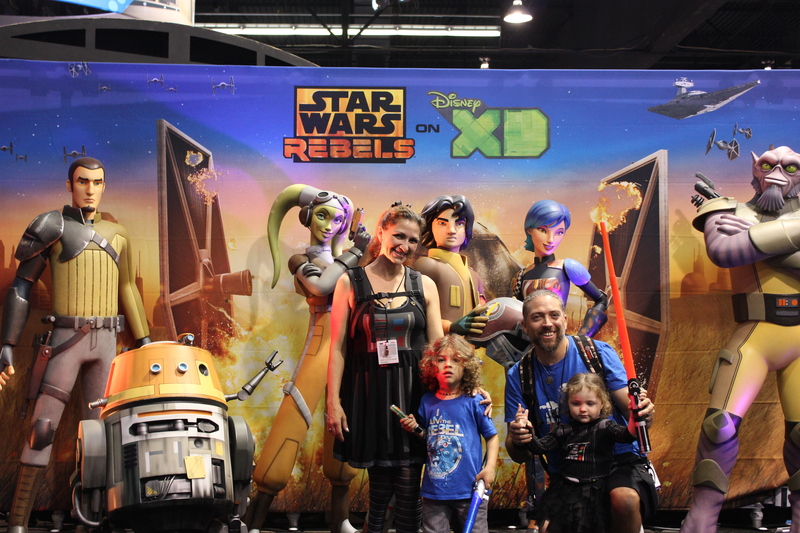 Five years of arranging our lives as Star Wars enthusiasts in such a way that it never came up to the point where it had became a situation like Santa Clause for us. Five years of expectation where our own excitement grew for the future date when we would get to share this with them. A full Star Wars marathon with our friends and family all there, in costume, maybe for a birthday or over a holiday weekend… but all that expectation and anticipation was blown in a 10 minute show called “Path of the Jedi”. A show where the entire story, ALL of it, is laid out with no warning, no opportunity to walk out, no chance of avoiding any of it. Even if we’d literally run out of the theater right that minute, when I realized how deep into the story they were going to go, we still would have already hit the Vader being their father, hand getting cut off and Leah is your sister before we’d have gotten out. It is a time of celebration – the Season of the Force! Here’s what I expected; an exciting 4D film showing how Luke trained to become a Jedi, showing training scenes like when he lifted the ship out of the swamp with Yoda or when he trained blindfolded on the Millennium Falcon or maybe even when he fought Vader, how they nearly evaded a sand burrower, went to light speed with tie fighters on their tail, or how he was awarded a metal for saving the galaxy… All which could have, and I assumed would be, done without spoilers. It never occurred to me that you’d reveal the entire story along with every secret, epic moment of the series in a spliced together 10 minute short film. I mean, sure – it will still be entertaining. Of course, they’ll still enjoy it, but that isn’t the point now, is it? The point is… we were trying to give them the gift of an epic reveal and the lack of attention to a single detail is the only reason they will never get to have that experience in that way. To say that I’m severely disappointed is an understatement and the bottom line is, the film should have had a disclaimer and I’m asking you to please add one for future guests. I’m aware that people think I’m being silly… but it’s not just me and I’m not the only person, or parent, on the planet who doesn’t want plot lines of films ruined for themselves or their families. Case in point; how many friends have been lost in just this last month over revealed plot lines of The Force Awakens? 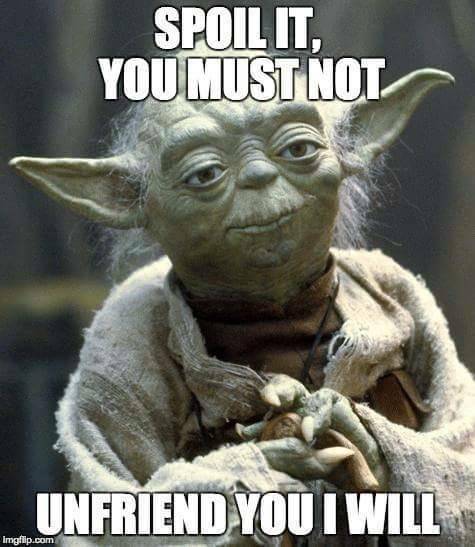 I personally know three people who “unfriended” someone because of Star Wars spoilers. For the last month, Facebook has been flooded with messages begging friends and family, to please protect one another by NOT revealing a single, solitary detail- however minuscule it may seem- about the new movie. Much like the meme above, I know people who have cut friends out of their lives completely for revealing the plot. I also know people who simply went “dark” for two months with zero contact with social media or the internet in general to ensure they never saw anything they didn’t want to know. The passion for this franchise is no secret and yet, you tell the entire story of the first six movies in ten minutes with absolutely no warning. You and the average person may not think it’s a big deal, but this is a MUCH bigger deal to me than just a 38 year old movie’s plot being revealed. The Disney that protects a child’s innocence by never breaking character, never ruining the magic, never allowing a child to know that a princess is just a girl in a dress getting paid to hug her… THAT Disney knows better. The Disney that built an empire giving magic to millions, protecting children’s hearts from the reality that Mickey Mouse does not actually live at Disneyland next door to Minnie, across the street from Goofy and Donald, knows better. The Disney that built a maze of backstage and underground tunnels to ensure a costumed character was never seen off stage or accidentally revealed to a guest and “killing the magic” would have known better. My Disney, the Disney I go to bat for in a heartbeat, knows better. This oversight implies that someone there made the choice to shrug and assume no one would care. This cannot be compared to the Frozen stage show in the park or the Beauty and the Beast show or even any of the story rides that tell each tale from start to finish because you KNOW what it is walking in. Is this an example of what we are going to see in Star Wars Land next year? Is this an early indication of what lies ahead? Will I even be able to take my kids to that side of the park if I wanted to keep that secret alive for them? Or are you just going to lay it all out there, without giving ANY thought to the fact that there are still millions of people (and more being born every day) who have not yet seen this movie? Will it be Star Wars Land or Spoilers Land? As we get deeper into a world of technology and easy access to all media, it will be harder to keep secrets and parents will have to make choices. Do we share the magic early, possibly so early that the don’t really even get it? Or do we wait until they’re older and can take it all in and fight with everything around us to keep them from seeing it? It should be your job to do all you can to protect that magic, protect these tiny hearts and understand that while yes, this is OUR generation’s movie… the generation we have created deserves that same respect and the same magic that we got to have and it is not our right to deny it simply because it means we have to have a little self control, keep our mouths shut and maybe rework a few things to prevent them from learning too much, too soon. Star Wars is not “just a movie”. True fans know better than to show something like this to the general public without a warning. All I’m asking, is please give your guests the chance to make the choice for their families. I’m not calling for it to be removed or even changed… only that you add a disclaimer to the signage and if this IS an indication of what the new Star Wars Land has in store for us, please let us know before we get there so WE can make that choice. Don’t just say, “epic Jedi battle”… tell us; “this ride reenacts the famous xyz scene; caution, spoilers!” or something like that. Be the Disney I trust. Be the Disney I believe in. Don’t allow another child to be denied that magical moment.